Becoming an expat parent comes with its own set of challenges, none more so emotionally charged than settling family in a new country. Moving abroad typically means leaving behind extended family, friends and close neighbors, who form a web of support on a daily basis. The prospect of relocating and rebuilding close friendships can seem daunting to parents let alone the children involved in the move. The initial transition can prove to be tumultuous, filled with tears and tantrums. Navigating through parenthood is hard enough, but when relocation is added to the mix there is no telling how children will adjust or adapt to new situations. While children do adapt easily, many parents know that the experience is hard on them especially in the initial transition. Parents may yearn for the stability they left behind, but how can they recreate the network of support again in a new country? Kid’s Island Nursery has been in Dubai for 28 years, and has provided a stable network of support to thousands of families over the years. The Nursery is an extension of the family, providing parents support to settle in an expat village, while offering guidance and stability. Their team of caring staff strives to create a loving, nurturing environment from which the families and children can grow. Kids Island Nursery in Dubai was founded over two decades ago by Isabelle Amatoury. The philosophy of the nursery centers on the fact that each child is unique and should be given the opportunity to explore and learn. The Nursery follows the British Curriculum and caters to children starting preschool and kindergarten. They provide a safe and nurturing environment helping children gain social skills and increase self-awareness. As parents it’s tempting to do everything for our children and often WANT to do it, as well as it being easier and faster! Teaching them independence from an early age has the most impact to build a child’s self-esteem and confidence. A child’s brain starts developing from day one and by acknowledging that they’re capable of doing things for themselves, we as parents can have a positive impact on their overall development, understanding of the world, self-confidence, as well as emotional maturity. When a child feels empowered, they want to do more. Children learn by watching those around them and model their parents. For example, when a child starts to feed themselves, it not only helps with sensory development, and meal times become a social event. They might start by eating with their fingers and progress to cutlery once their skills develop over time. We might need to deal with a ‘mess’ and should welcome this as it is about the experiences for the child. So what small changes can we make every day to nurture independence? Set realistic targets. Allow the child to go through the process over and over to make the experience a learning curve and fun. Enjoy the time with your child and bestow a lot of praise. Adding pressure builds up stress for parents and children. Very early on we should be encouraging children to eat by themselves, wash their hands and sit at a table with their parents for mealtime with the family. There are some activities that children can help with too, such as packing toys away and pushing a baby shopping trolley. As children get older, their independence grows along with their self-confidence, therefor they will want to participate and contribute more. We should encourage this from little things like, throwing their bib in the laundry basket, fetching shoes when it’s time to leave the house, putting their shoes on by themselves, wiping their face with a wash cloth and happily playing alone. We can stimulate the children by singing together as we clean up (sing ‘Clean up, clean up, everybody do your share’) and appreciate these moments with your child. Give them your full attention and focus. Take a break from your phone and your laptop. It might take a little time - a child learns to talk by being spoken to, by experiencing and articulating sounds / words and then one day a sentence will form. As our children navigate their way through life, learning right from wrong, forming opinions and personalities, the independence they acquire from an early age can put them in great stead for taking on challenges with confidence. Support your child, by encouraging them to help themselves. What a great way to let the children mix, kneed and explore this special sand dough and at the same time develop their language and fine motor skills in a very creative way! Engage in a conversation that supports this activity i.e. What textures do you feel? Is it soft, hard…? What happens to the flour when we add water? Where can we find sand in Dubai? What can you do with wet sand, and dry sand? Combine the flour, salt, water and oil in a mixing bowl. Knead with your hands until the mixture forms a ball. If the mixture is too dry, gradually add water until it reaches a nice dough consistency and if the mixture is too watery, gradually add more flour. Let the child’s “creation” dry on a tray. February has just burst through the door! The thought that we are well into the second month of 2016 creates a response of nodding heads and tut-tuts about how quickly time seems to fly. And yet it seems as if it were only yesterday that January arrived in a shower of confetti-shaded hopes, wishes and resolutions for the new year ahead. For many of us, this is the time of the year that we look at the year gone by and assess what we could have done better or achieved more with ourselves, our children or our family. And so during the beginning of the year, we often create grandiose resolutions during which, with steely resolve, we promise ourselves that we are going to do more or change more. By February all those plans have faltered, as we protest at how difficult it has been. Actually, those plans were more than likely to fail because we are trying to change too much, too quickly without enough resources or without enough time. Perhaps, instinctively, we know that they are going to fail and so we give up before we have even started. The “One percent Principle” goes a long way in explaining why resolutions or long-term plans often fail. It basically suggests that we often avoid setting major goals because achieving them seems so overwhelming. Sometimes changes we are trying to establish may be too great. Interestingly, the theory continues to support that small, often subtle changes create a momentum that increasingly brings about much larger change. I would say that when it comes to our children this idea makes a lot of sense. Very often we, working in early years children’s nurseries in Dubai, hear parents saying that they are going to start disciplining their children more, spend more time with them, establish better eating habits or help them achieve better grades. The plans come from a good place but are often too general, broad or too drastic. With children, we cannot start changing established habits all at once. It creates too much insecurity as children do not know what to expect. Yet, if we change small things incrementally and consistently, we stand a better chance of succeeding which in turn will bring about confidence in ourselves and our abilities as parents. If dad arrives at home half an hour earlier to read a story to his child he has basically started and achieved in measure the change planned. Scheduling family dinners together over the weekend and at least once during the week creates the basis for a habit that impacts language, communication and cognitive skills. Half an hour less on the I-pad will mean half an hour more time playing and developing physical skills. Speaking to our children and others using “and “instead of “but” will reinforce that respect and love are not conditional. Small, positive changes that we apply with consistency can have the potential to create a lasting effect. The “W” sitting position in young children. Lying, rolling, sitting-up, crawling; infants go through a host of developmental stages before they develop the coordination, muscle tone and strength to finally walk. Each motor stage milestone emerges once the previous is matured and mastered. Over the years, we have seen children with various levels of coordination, gait, posture and balance. It is not uncommon to see children sitting in the “W” position: when a child sits with their knees bent and tucked under them in a ‘W” configuration. However, from a physiological and developmental perspective, it is something that we should be aware of. Children often prefer to sit in this way because it creates a wider support basis and greater stability of the hips and torso. This helps seated children balance better when playing, reaching out or moving. So what is the problem, then? Actually the issue with “W sitting” is that it decreases the need for “trunk control”; the ability children have to shift their weight and ultimately impairs “trunk rotation”. Trunk rotation is vital for stretching movements when reaching to grasp or catch objects with one or both hands, for actions that require balance such as skipping, as well as midline crossing crossing arms from one side to another. Midline crossing is necessary for developing hand preference/dominance necessary for advanced level skills such as handwriting and reading. Habitually sitting in the “W” position may also impact the way muscles of the hips and legs develop (shortening and tightening); often leading to children who are pigeon-toed or walk on their toes. As educators, it is important to take note of children who prefer to sit in this potion as it may be the tell-tale sign of other underlying issues; children with hyper-mobility of the joints and sensory processing disorder. It may also indicate the retention of developmental reflexes such as the Symmetrical Tonic Neck Reflex (STNR) - a transitional reflex which helps children move on from the stage of lying on the floor to crawling or the tonic labyrinthine reflex related to balance, muscle tone and proprioception. Reflexes such as these which remain unintegrated may manifest in later childhood as poor posture, poor muscle tone, difficulty in sitting still, challenges with reading and writing, poor hand/eye coordination, focusing on a task and vision disorders. Naturally, it is easier to correct the “W” sitting position before it becomes habitual. Together, parents and school should be aware of it and encourage children to sit in alternate positions: side sitting, long sitting or cross-legged sitting. The role of nursery should be so much more than just a play area to socialise. Good nurseries in Dubai will have teachers with an experienced and sensitive eye who will be able to pick up and communicate physical nuances that need to be addressed consistently so that nursery and the home environment can create a strong support network. For more information regarding unintegrated reflexes please refer to Kinesiology Dubai's Website or alternatively contact the office. Looking for a recipe to make ornaments for the holidays? We found the best one and you only need everyday kitchen ingredients to do it! Mix the baking soda and cornstarch in a pan. Add the water and mix. Place on stove (medium heat) and bring to a boil stirring constantly throughout. In few minutes, the watery mixture will thicken and suddenly become almost like mashed potatoes. Straight away remove from the heat and place mixture onto a cookie sheet in one lump. Cover with a damp cloth and leave to cool. Once it is cool enough to work with, lightly dust the surface with cornstarch and roll it out into a snake roll. Divide it into smaller chunks. It will have the smooth consistency of fondant. Stamp it with stamps (with or without ink) and then cut it with the cookie cutter, finishing it off with a hole using the straw. Leave it to air dry overnight. Discussion: What happens to the ice when we paint with it? What happens to the water when put in the freezer? How does the ice feel? Activity words: wet, melting, cold, freezing, very cold, frozen, hard…. Remember to make the activity fun, and encourage the children in their creativity. Preparations: Each teacher must make her own ice cubes. Fill a jug (1 liter) with water and add half a bottle of food colouring or paint. You may want to do more than one colour. Fill the ice cube trays and place in the freezer overnight. You may want to add popsicle sticks. Place a piece of paper in front of each child and then give them each an ice cube. They will see how cold it is to hold and then the excitement of what they can create as the ice-cube melts on their pieces of paper. 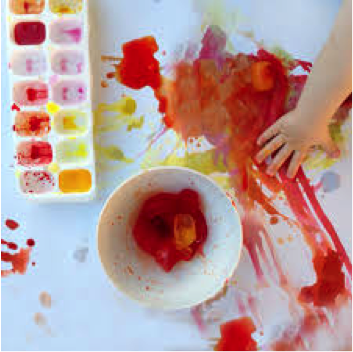 Encourage the children to move the ice cube around their piece of paper, creating patterns and shapes. Kids Island Nursery and Cocoon Nursery have a new look! Kids Island and Cocoon Nursery are exited to announce our new website! With the new year passed and the holidays over we have started the new term with a big announcement! From our new logo and website to our incredible new facade the nursery has worked incredibly hard to bring you a fresh new look. Thats not the only thing we have done. Just like every new year we get so exited ordering new toys, supplies and brainstorming new fun and inspiring projects to get the creative juices flowing. This year more than ever we are pushing our Proactively-Eco initiative to recycle even more, reduce waste and encourage healthy living. We cant wait to hear what you think!